THE new chairman of Henley Town FC says he wants to get residents of the town “interested” in the club again. John Hooper, who took over from Kim Chapman who left the club earlier this month, says he hopes the club will promote more local players, including those stepping up from junior side AFC Henley. Mr Hooper, 71, of Ancastle Green, said: “The idea is to get Henley Town back on the right track again. “We’ve now got a good local committee full of ex-players and we are looking forward to trying to build the club so more people from the town are using it. Jock Mowat has also been appointed the new manager of the Red Kites following Jon Laugharne’s departure. The former Woodley United manager was assistant to former manager Gerry McGinty when he was appointed the top job in July last year. McGinty left the club in October to become youth team manager at League 2 club Barnet. Mowat then took charge of the side for a matter of weeks until a permanent replacement was found. Rob Creech took over in November with his two assistants, Andy Findlay and Mowat. But Henley finished bottom of the Premier Division with just four wins from 34 games, and Creech and Findlay left the club soon after. Mr Hooper said: “The previous year (2015/16) Henley Town were very successful but this season has been an absolute disaster. “Most of the players that did well the previous year left the club, the manager didn’t stay with the club and players were coming in and out very quickly. The club became unstable and nobody was really interested in it. Mr Hooper has a long history in football, playing as a defender and midfielder for sides in Henley, Shiplake and Wargrave as a youngster, while his father Jack also founded the old Henley Casuals side. He also refereed in leagues in Oxfordshire and Reading, as well as the FA Cup, FA Vase and FA Trophy, and was the fourth official in the old Division 1 for Oxford United on five occasions. Mr Hooper joined the committee of Henley Boys, now known as AFC Henley, in the Seventies when his son Paul was playing for them and served as chairman for more than 30 years before becoming the club’s president. He was also secretary for a side in Shiplake before taking over at Henley YMCA with two friends. 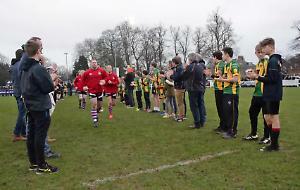 The men led an upturn in results for the club, which finished runners-up in their league in two consecutive seasons as well as winning the Ted Cambridge Cup this year. The club now plays on Sundays at Henley Town and will compete in the Reading Sunday League Division 1 for the 2017/18 season. Henley Town first team will play in the Hellenic League Division 1 East next season, while a second newly-formed Saturday side will compete in Thames Valley League Division 3. Mr Hooper, who ran the family boat hire company and his own painting and decorating business, said: “I’m born and bred Henley, my family have been here for centuries. “We’ve got some really good local people on the committee with some others who have been at the club for many years. “It’s going to be a struggle this year but everyone is optimistic that we can turn this around. “People have got on board to work for the club and we are getting people interested. “So many local players are involved with the Sunday side and with the new Saturday team and we will hopefully get some coming through to the first team. “Local players will bring their mates along and hopefully the parents and friends will come along to watch them play.